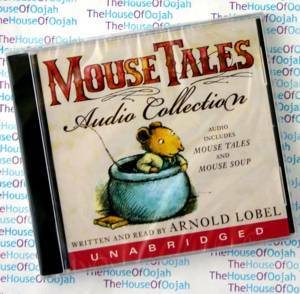 includes Mouse Tales and Mouse Soup..
Two classic stories by Arnold Lobel! Mouse Tales: "Papa, please tell us a tale." When Papa's seven little mouse boys ask for a bedtime story, Papa does even better than that -- he tells seven stories, one for each boy! Mouse Soup: Mouse is in a jam -- soon he'll be weasel soup! Arnold Lobel (born May 22, 1933, died December 4, 1987) was a popular author of children's books. Among his most popular books are those in the Frog and Toad series, and Mouse Soup. Lobel won the 1981 Caldecott Medal for his book Fables. Lobel also illustrated the works of other authors. A notable example is Sam the Minuteman by Nathaniel Benchley, first published in 1969.